Hi guys! Hope you guys had a great weekend! I had a nice lazy weekend. I played with some planner supplies, and on Sunday, my husband and I went to go see Inside Out. I absolutely loved it! It was super cute, and a pretty clever way to show how we are driven by our emotions. Just be sure to bring some tissues! Today, I want to share one of the polishes that I won a few months ago from MakeUpMom123. I had heard about good things about Anonymous Lacquer, but I hadn't tried any of the polishes yet. I was really excited when I heard that I'd won 2 polishes from Anonymous Lacquer! 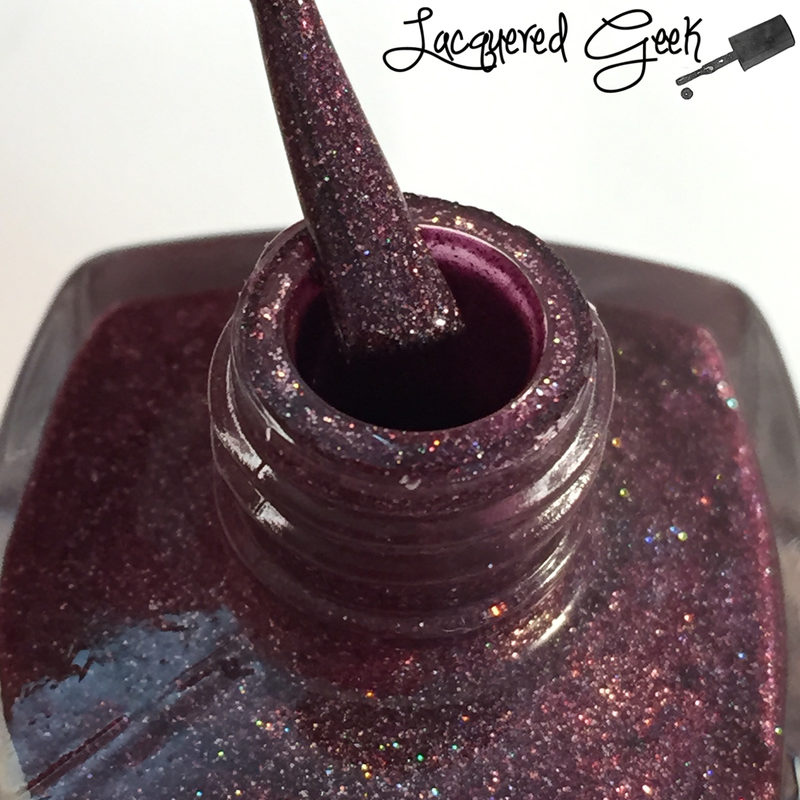 Fangalicious 2.0 is a gorgeous burgundy holo with microglitters. The formula was just perfect. It was like this polish was made exactly how I like my polishes to be! I used two coats topped with a topcoat for these photos. Fangalicious 2.0 is seriously stunning, and I couldn't just pick one or two photos. Take a long look at this holo-riffic goodness! Isn't it so freaking sparkly?! Isn't Fangalicious 2.0 amazing? I can't wear to wear this vampy shade this fall! Do you have a favorite polish from Anonymous Lacquer? Thank you. It helps when the polish is so pretty! Love the macros! Such a gorgeous vampy polish! I only have one Anonymous Lacquer, a neon pink holo group custom and absolutely love it! That polish sounds awesome! Neon + holo!! Love this shade! So vampy and gorgeous. Don't have a favorite yet as I only have one so far :P This is a gorgeous color!! Beautiful colour! I've not tried Anonymous Lacquer yet, but it's a brand on my list to try out soon! Gorgeous Macro!! That sparkle is lovely! Your macro is awesome. Love this color, it's so unique. This is beautiful and so gorgeous on you! Love that sparkle. Gorgeous! Such a vampy polish!